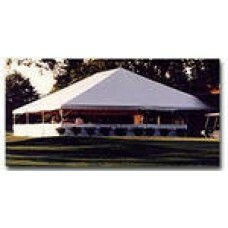 Eureka Twin Tube Frame Tent 20'x 20'The Eureka! Twin Tube system represents the state of the art for rental frame tents. This system consists of 4 different aluminum extrusions (1", 2", 2x4" Twin Tube, and 2 x 6" Twin Tube) and a series of connectors, baseplates, and sidewall brackets that all work interchangeably as a system. The patented Twin Tube aluminum allows the renters to build strong tents with fewer parts and wider distances between uprights. The system is clean, unobstructed and intelligent. Also Available as a 20'x40', and additional increments to 1000 feet!!! !